Did you know that yellow school busses safely transport almost 25 million kids to and from school every day? We carry 2,000 of them right here in Pleasanton, Texas. That is 2,000 good reasons to drive safely and remain alert when you see a school bus on the road. The maximum fine for a first offense of stop-arm running in Texas is set to increase 25% — from $1,000 to $1,250. The change goes into effect Sept. 1. With Texas students heading back to school, the state Department of Public Safety (DPS) is reminding drivers to watch out for children walking to and from school or waiting for school buses, and to obey all traffic laws related to school buses and active school zones. Agency officials noted that one of the most dangerous parts of a student’s trip on a school bus is when entering or exiting the bus. 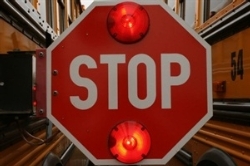 Texas law stipulates that if a road is divided only by a left-turning lane, drivers on both sides of the roadway must stop for school buses with their red lights flashing and stop arm activated. However, if the lanes are separated by an intervening space or physical barrier, only motorists going in the same direction as the bus are required to stop. Along with the new increased fine for stop-arm running, state law already allows DPS to suspend the driver's license for up to six months for those convicted of the offense more than once. As part of this year's national stop-arm running survey, Texas school bus drivers counted 9,825 violations during one day this spring.